I stopped into the brand-new Microsoft Store in Atlanta on opening day last Friday. On the whole, it’s something that needs to be done for the sake of unifying hardware with Windows, but I wasn’t totally sold on the execution. Boy, were they trying hard. Even down to individual elements, design inspiration from Apple was very obvious. Pricetags next to each machine looked very similar to the inclined plane-esque placards that used to grace the Apple Store (before the iPads), and the screens wrapping around the wall were probably the exact same dimensions as their upstairs counterpart. I could go on about the similarities – everywhere you look, the physical design screams Cupertino. The music inside was also a little too loud; I couldn’t hear much outside of the blasting of Ke$ha. Hopefully that was just a little first-day overzealousness, but that extended past the decor. The employees were really aggressive in approaching people; walking in felt like being in a gauntlet of being asked how I’m doing, if I needed any help, or if I knew that “this computer is touchscreen!”. 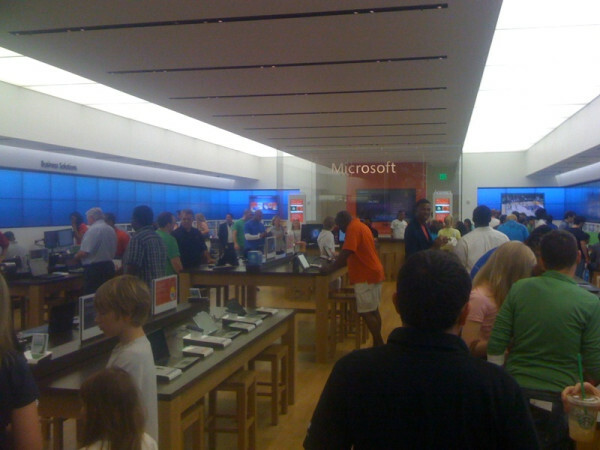 At the Apple Store, the employees are bombarded by the customers, but at the Microsoft Store, the customers are bombarded by the employees. Even if the idea was far from original, there’s an interesting twist on the wraparound wall displays: they’re actual screens, not just sheets advertising products. Information about different products is rotating marquee-style, and even cooler, Xboxes are connected in certain areas and can be played on the screens. 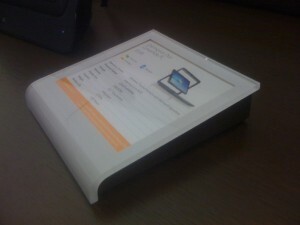 Two Microsoft Surfaces were also sitting out - if nothing else, this is the one element that makes the store unique. Most of the people that’ll come in from foot traffic will likely have never seen a Surface before, so at least for a while, it’ll be a good way to generate buzz. Over time, the idea of the store will come to settle with people, and if you’re genuinely looking to buy a PC, it’s one of the better environments for buying a PC that I’ve seen. I doubt it’ll convert many Mac users, but it’s a great option for the existing base of Windows fans who are itching to buy a new machine.